as his great granddad sailed on her. Noting that you posted this in the 1/1250 scale section, does that mean you are looking only for this scale? 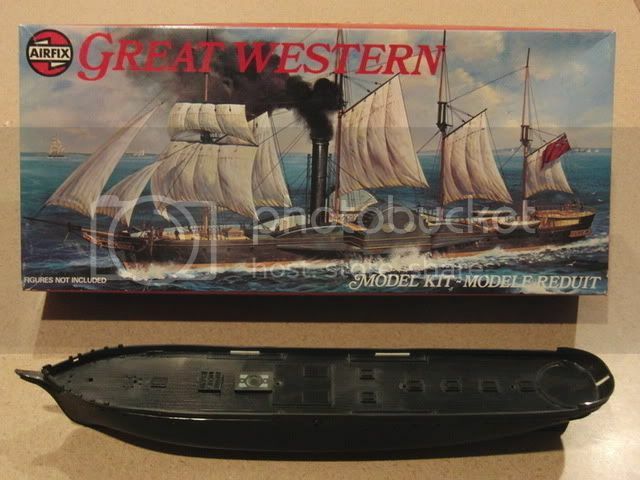 Airfix issued two kits of the Great Western although both are quite old. I don't recall the scales, but one about 4" long and the other about a foot long. I believe I have both in the stash and will check when I get home. 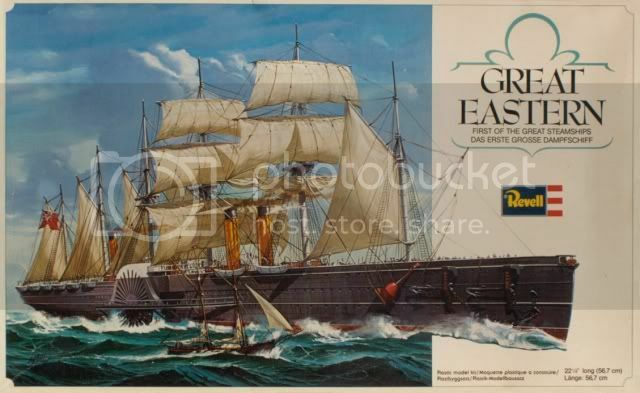 Great Eastern; One of my favorite ships. I believe there is a 1:1200 or 1:1250 kit, although that's not my scale. 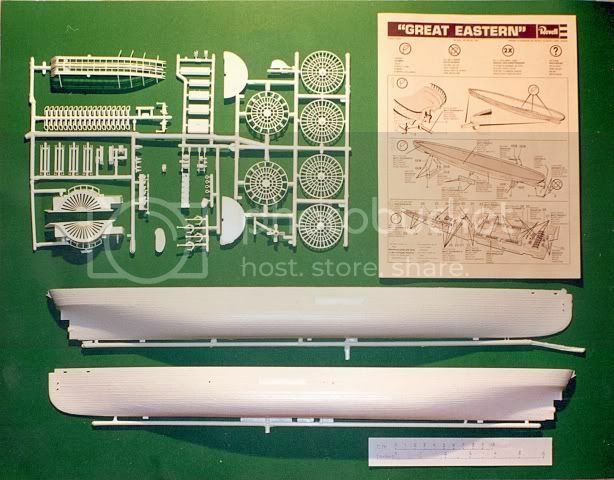 Almost 50 years after its release, the Revell 1:388 Great Eastern remains the only injection molded kit of the great ship to reach the market. Since it’s original release in 1963, it has been reissued several times by both Revell and Entex, most recently by Revell of Germany in 2002, kit number 05201. Considering the age of the molds, the kit holds up reasonably well and provides an excellent starting point for both the super-detailer, and the out-of-the-box builder. Given the age of the kit I’ll limit any criticism to the major faults. Super-detailers will of course be inclined to verify the accuracy of the kit on a piece by piece basis, although straight out of the box, the kit builds to a reasonable representation of the ship. Approx 210 pieces molded in white styrene. Earlier issues were molded in three colors: black, tan and red. Hull: The overall shape and proportions of the hull are correct and adequately capture the feel of the ship. Simulated iron plating covers the hull however, although pleasing in effect, it bares little resemblance to the longitudinal over-under pattern which is recognizable on the Great Eastern. It should not be too difficult to sand off the engraved plating and replace it with a more convincing representation made of Evergreen styrene strips if desired. Similarly the under surface of the bow and the area of the propeller shaft are slightly misshapen and would benefit from a little modification. Deck and Deck Structures: The main deck is molded in two sections, being split roughly at mid ship. Deck planking, although over scale, is lightly scribed and unobtrusive. Deck houses and skylights are molded onto the deck surface. The kit shows its age to some extent in that six coils of mooring line are molded to the deck and appear unnatural. Additionally all of the glass in the ships many skylights is depicted by openings in the plastic. It would probably be preferable to have the glass molded in place and painted rather than being depicted with the rather crude openings. 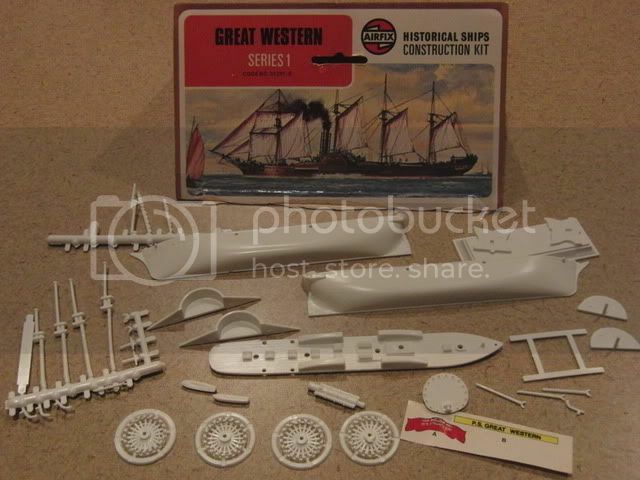 The kit depicts the Great Eastern during her early cable laying days, as she looked between 1865 and 1867. As such an abundance of cable laying equipment is included with the kit including winches, playing out governors, buoys and the deck top cable channel. This equipment is generally well represented leaving the modeler the choice of using it or requiring him to fill more than a dozen locating holes on the deck if it is not used. The number four funnel, which was removed when refitted for cable laying is not included and will need to be fabricated to represent her as built. Paddle Wheels: The large paddle wheels, although reasonably finely molded, are inaccurate in that they have 32 spokes and 16 floats rather than 30 spokes and 30 floats as on the actual ship. Additionally they depict the original lightly built wheels which were torn off in the storm of 1861 and not the later reinforced wheels as were fitted through her cable laying days. Floats are over scale and could be easily replaced with styrene stock. Openings in the sides of the paddle wheel boxes match those on plans drawn by John Scott Russell, her builder, differ slightly from those seen in photographs of the actual ship. 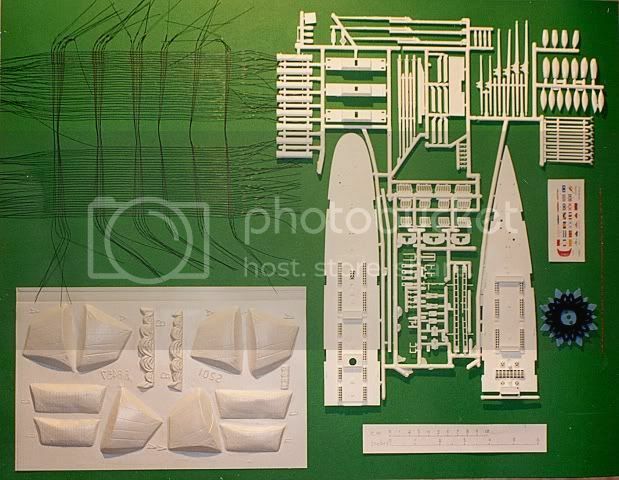 Masts and Rigging: Masts, yards and booms are generally consistent with other Revell sailing ship models. They are slightly crude and would benefit from a bit of clean up, if not outright replacement. The hoops which hold the fore and aft sails in place are molded to the masts and should be removed if sails are not modeled. The ratlines provided with the kit are more or less unusable, being over scale and I suspect difficult to work with. Sails are somewhat vague in detail and are typical of vac sails in appearance. 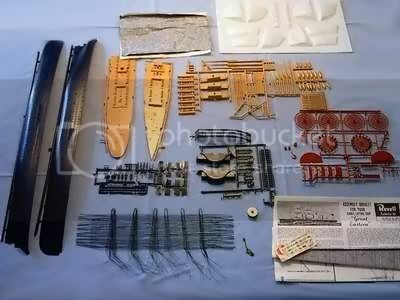 Detail Parts: Considering the age of the kit, the quality of the molding on various detail parts such as boats, davits, anchors and deck fittings is very good. I especially like the 38 davits which are finely molded and include a reasonable representation of the falls and pulleys. Conclusion: Considering the age of this kit there are few glaring errors which could not be corrected with a little effort. 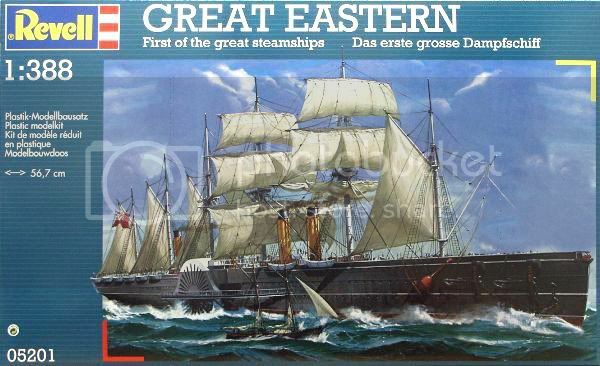 The kit adequately captures the look and feel of the Great Eastern, and can be built out of the box into a reasonable representation of the ship. Given the relatively simple design of the vessel, it should be fairly straightforward to correct many of the kit's shortcomings. The only injection molded kit produced. Inaccuracies in paddlewheels and coarseness of some parts. Availability: Although the kit has been reissued by Revell of Germany in the last Spring of 2002, it can still be difficult to find. Hopefully once the kits make their way into the distribution channels, modelers throughout the world will again have access to the only injection molded kit of this great vessel. The Eastern is a fine ship model. Do you still need this information?